The Albuquerque Biological Park has earned accreditation by the Association of Zoos & Aquariums (AZA). AZA President and CEO Jim Maddy presented the accreditation plaque to Mayor Richard J. Berry and the ABQ BioPark at a ceremony today at the Zoo’s Nature Theatre. To be accredited, the BioPark underwent a thorough investigation to ensure it has and will continue to meet ever-rising standards, which include animal care, veterinary programs, conservation, education, and safety. AZA requires zoos and aquariums to successfully complete this rigorous accreditation process every five years in order to be members of the Association. The BioPark has been continuously accredited for nearly 30 years. The accreditation process includes a detailed application and a meticulous on-site inspection by a team of trained zoo and aquarium professionals. The inspecting team observes all aspects of the institution’s operation in areas such as animal care; keeper training; safety for visitors, staff, and animals; educational programs; conservation efforts; veterinary programs; financial stability; risk management; visitor services; and other areas. The inspection team prepares an extensive written report for the Accreditation Commission. Finally, top officials are interviewed at a formal Commission hearing, after which accreditation is granted, tabled, or denied. The ABQ BioPark enriches the quality of life for all, through education, recreation, conservation and research, by providing a comprehensive park including the Aquarium, Botanic Garden, Tingley Beach and Zoo. The BioPark is an accessible facility and a division of the City of Albuquerque’s Cultural Services Department. Contact us at 311 locally, (505) 768-2000 (Relay NM or 711) or www.cabq.gov/biopark. Open daily from 9 a.m. to 5 p.m. Zoo or Aquarium/Garden admission is $7 for adults; $3 for seniors (65+) and children (3-12). Same day combo admission to all BioPark facilities is $12 for adults; $5 for seniors and children. Tingley Beach is open daily from sunrise to sunset and admission is free. Become a member of the New Mexico BioPark Society and enjoy benefits including unlimited general admission to all BioPark facilities and discounts to many special events. 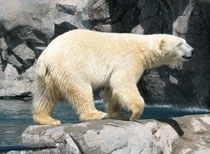 The ABQ BioPark is accredited by the Association of Zoos and Aquariums. Founded in 1924, the Association of Zoos and Aquariums (AZA) is a nonprofit organization dedicated to the advancement of zoos and aquariums in the areas of conservation, education, science, and recreation. Look for the AZA logo whenever you visit a zoo or aquarium as your assurance that you are supporting an institution dedicated to providing excellent care for animals, a great experience for you, and a better future for all living things. AZA is a leader in global wildlife conservation, and your link to helping animals in their native habitats. For more information, please visit www.aza.org.